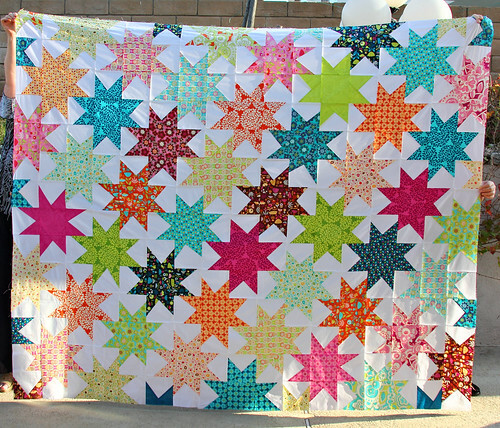 This year I am submitting my Interlocking Stars quilt that I made out of my favorite fabric line Park Slope by Erin McMorris along with Kona White. It took me along time to find the right pattern for these fabrics and when I stumbled onto this pillow I knew that I wanted use this pattern. I wanted to make a really large twin sized quilt so that it could be my youngest daughters bed quilt when she got out of her crib. She still is in the crib so I put it on my other daughters bed to get some pictures. This quilt really is a queen since it is 102" x 85". Luckily when I needed to lay this out my Mom was here to help me! Thanks again Mom. Here is the back of the quilt. The back is all Park Slope fabrics. This is the perfect girls quilt I think and now I just can't wait for Penelope to get into her twin bed so I can make pillows to work on the bed and we can enjoy this quilt everyday. Here is my original post with a little tutorial if you would like to see how to make this pattern. Wow, double WOW. Your quilt is beautiful. So bright and cheery. Totally love! THe colors, the pattern...it is all fabulous! Those stars are huge!! Love it! Beautiful! I love interlocking patterns... Haven't had the nerve to sew one yet but I'll get there. Gorgeous! I love the back too. 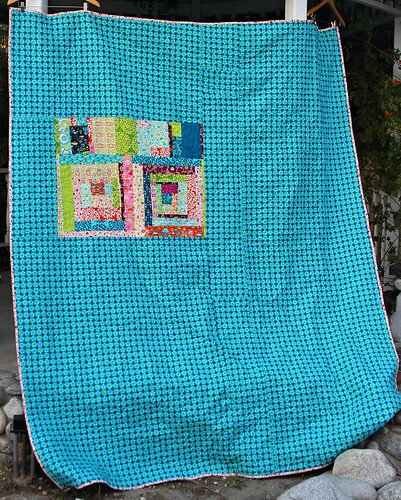 That is a big quilt which is so great because little girls do grow up! Lovely. It's fantastic. So bright and cheerful. This is awesome. Really delightful. 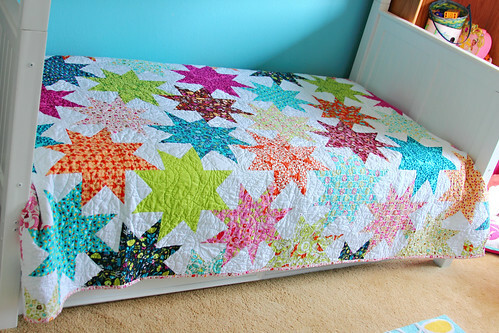 I love these colourful stars! It's a beautiful quilt! So bright and fresh looking. You'll be glad you made it so large! Beautiful, the blocks must be big. I love the springy look. I LOVE this! Those must be some huge stars. Beautiful quilt! I love the fabrics and stars are one of my favorite patterns! this is so bright and cheery, I love the colors! Its beautiful! Yikes!! I am in love with this quilt!!! Wonderful! Stupendous - love those colours! I do love this quilt Miss Darci! Gorgeous, gorgeous quilt! And it's huge!! I love the stars, such a sweet pattern! 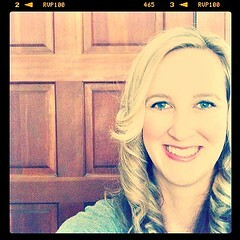 Kinda thinking this is one of my favorites! So awesome! I just love your quilt. Its a fabulous design. I totally missed seeing yours until it was narrowed down! You got my vote! Good Luck, I hope you win!! Love this! Wonderful choice of fabrics....so bright, cheery, and happy! I love this quilt. Thanks for the great tutorial. Congratulations. Your quilt was one of my favourites! Congratulations on winning! Love the quilt. Congratulations on your win! It's a gorgeous quilt. 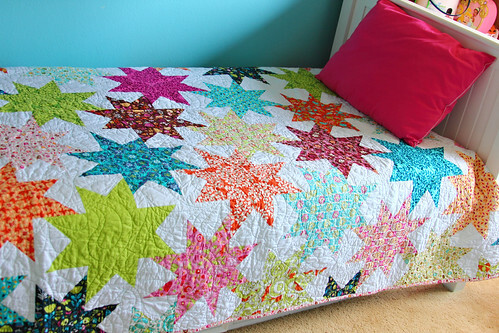 Thank you Darci for the tutorial on how to make the stars, and the layout of the quilt. It is just lovely. Congratulations for winning, I am happy for you. Congrats on the win!! I *still* love it! Glad others did, too!